Over 90% of people who have Type II diabetes struggle with weight problems. The correlation is so direct that most people consider the words “obese” and “diabetic” to be synonymous. In addition to high blood sugars (“hemoglobin A1C”), people suffering from obesity are also more likely to suffer from high blood pressure, high cholesterol, high triglycerides and a high percentage of body fat. Even worse, most live a sedentary lifestyle. Diabetes is now the #1 preventable cause of death in the US, beating out smoking, the longtime scourge of polite society. Hundreds of billions of dollars a year are now spent on diabetes-related health care, yet the disease is wreaking havoc on the lives of the afflicted everywhere. It’s clear that sedentary lifestyles are the single biggest change in modern society. This computer-and-takeout-food lifestyle is even more destructive than our supersized intake of calories and fat. Sitting is now understood to be the real killer – a single hour of sitting is considered by many the equivalent to the effects of smoking one cigarette. Studies have shown that those suffering from obesity spend two more hours sitting than people of normal weight – sitting in their cars, at their desks, in restaurants and in front of the TV set. Want to make sure you don’t develop diabetes? Or want to learn how to kick your metabolism back out of diabetes? Using a treadmill desk may be the surest path to success if you find yourself caught in the rut of a sedentary lifestyle. People looking to show how advanced modern society is point to our capacity to multitask. Are we becoming superhuman? Unfortunately, we’re more often figuring out ways to be less active. However, multitasking on a treadmill desk is one of the best ways to approach the concept. 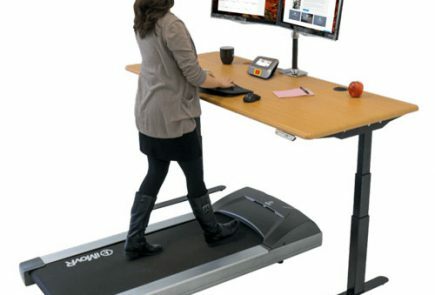 A treadmill desk allows you to get your work done or watch your favorite show on Netflix while you enjoy a brisk walk. For each hour you spend just standing at a treadmill desk, you reduce your sedentary time by that hour. Every minute you’re not sitting, you’re keeping your metabolism in a higher gear. Adding walking motion – even at the casual 1 to 2 mph pace of treadmill desk users – will kick your metabolism up a couple of notches higher from there, burning between 100 and 130 calories per hour, even though you might not break a sweat. Among people stuck in a sedentary lifestyle, it’s normal to feel resistance from your body when finally getting to the gym, participating in sports or going for outdoor walks. You can feel overwhelmed. A virtual wall of inertia can hit you, not just from the wane of will power (a result of prolonged inactivity), but from real aches and pains that result from atrophied muscles and stiffened joints. Walking at a treadmill desk provides a perfect middle ground, one that is easier on the body and psyche before you jump back into a fully active lifestyle. 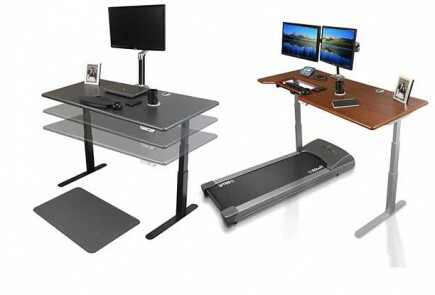 Your treadmill desk can serve as the bridge from a sedentary lifestyle to one in which physical activities are an integral part of the routine. Even at casual strolling speeds on a treadmill desk, a quality ramp-up regimen will give your ligaments a chance to tone and enable you to tackle exercises that demand more from your body. When you go to the gym, step on a field or stroll along a hiking trail, you’ll do so with a lower risk for injury and pain. Diabetics must be alert for sudden rises in blood glucose. Having a treadmill desk in the home or office is a great way to shave the peaks off those glucose readings. If you eat too much or take on too many carbs with a meal, getting on the treadmill desk will immediately help your body dissipate the glucose in your bloodstream, and at 1 to 2 mph walking speed, you won’t get stomach cramps as you might with more strenuous exercises. Another great technique for keeping those glucose peaks subdued is to actually eat while walking. At slow walking speeds, it’s surprisingly easy to munch on a salad while catching up on your reading or video viewing online. Lunching on your treadmill desk pays a double dividend by keeping you away from restaurants offering tempting fare packed with sugar, fat and salt.